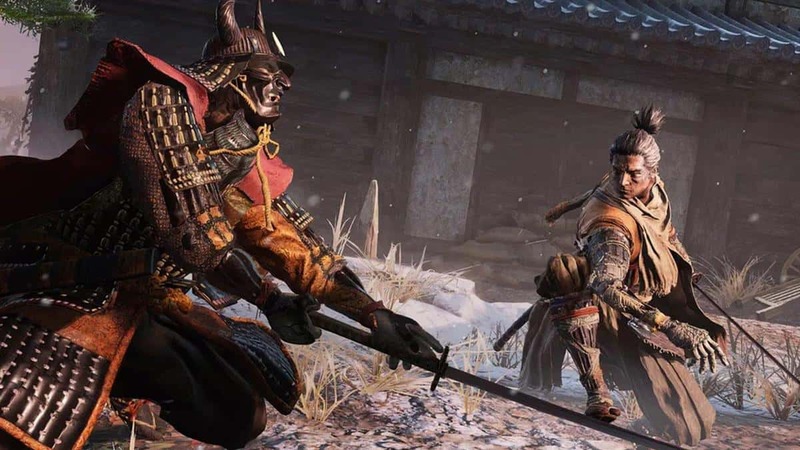 Similar to Dark Souls and Bloodborne, Sekiro Shadows Die Twice has many boss fights of varying difficulties. The bosses are encountered at different points throughout the game with each one possessing unique move sets and mechanics. Some bosses may be optional and can be played in a different order depending on what area you visit first. The bosses you encounter have special move sets, increased health, and unique mechanics. Most of them have several health bars that you need to empty but it doesn’t matter if you remove them entirely, just as long as you completely deplete the Posture Meter of said boss and then performing a Deathblow. Parrying the boss’s attacks is the fastest way to achieve this. Performing a Deathblow on a boss at full health will still result in a health bar being removed. However, some attacks cannot be parried so be sure to dodge them by jumping or using the Grappling Hook. Whenever you encounter a new boss, we recommend you do a practice run where you only focus on blocking and dodging without even attacking. This is a great way to learn the attack patterns and look for an opening. This boss is located in the Ashina Outskirts, at the Outskirts Wall Gate Path. He is a big samurai that you will encounter in the courtyard immediately after the Sculptor’s Idol. The best tactic for this boss fight is sneaking above the rooftops on the left without the General spotting you, sneaking up behind him and stabbing him in the back to take one of his lives away. Now all you have to do is your standard sword attacks and whenever he attacks, simply block or counter. Blocking his attacks is not that risky and after you have, you can attack him again. Keep repeating this until his Posture Meter breaks and then finish him off. Finishing this boss fight rewards you the Prayer Bead and Gourd Seed. This boss is located in the Ashina Outskirts, Wall Stairway. You can find him right past the Sculptor’s Idol and up the stairs. The first thing you should do is eliminate the smaller enemies in the area before you deal with the Ogre. Take out the two guards at the bottom of the stairs and then head upstairs and turn left to kill an enemy with a spear. Now you can fight with the Chained Ogre one on one. You can win this fight without taking a single by dodging the Ogre’s attacks until you are behind him and then start landing 2-3 hits. Keep repeating this until he is down. After the fight, you are rewarded with a Prayer Bead and Shinobi Medicine Rank 1. This boss is also in the Ashina Outskirts, Wall Stairway. You will find him in the next area after the Chained Ogre. With this fight, it is best to ignore General Tenzen Yamauchi initially and take down the smaller enemies first. Try not to lose too much health here ideally without using heal. Once these enemies are down, get out of the battle area and out of the General’s sight. Return and sneak behind his back to attack from behind and take away one of his lives. Follow the same pattern of dodging and attacking as with the Chained Ogre fight. Repeat this until his defense breaks off and then finish him. This fight will reward you with a Prayer Bead. Do note that if you killed the first boss Naomori and were awarded a Gourd Seed from him, you can find another in the building after the Chained Ogre. You can use these two Gourd seeds to upgrade the Healing Gourd twice so you have 3 heal charges. This mounted samurai appears atop a mighty steed and will charge into battle wielding a massive spear. He is located in the Ashina Outskirts in the Ashina Castle Gate Fortress Idol. After defeating Yamauchi, you must drop down a cliff where a tree is facing a big abyss to the other side. You will then come to a canyon where you will have to take out a big snake. Follow the path until you reach a battleground where Gyoubu Oniwa will show up on his horse. This boss has long range but his defense is weak so the ideal tactic is to wait and block his attacks until he gets ready for his heavy strike. In the process of his heavy strike, he gives you a 2-3 second window in which he is completely defenseless so strike him twice. Immediately start blocking again or dodging if your posture is about to break and take a moment to let it recharge. Keep repeating this step until you have taken his second life and then grapple onto him to finish him off. Alternatively, you can try simply grappling on to him when a green circle shows up on him to stun him for 2 seconds. This gives you a chance to strike again. Defeating this boss will reward you with the Mechanical Barrel and Memory: Gyoubu Omnia Strength Upgrade. You can find this enemy in the Hirata Estate and towards the Estate Path. 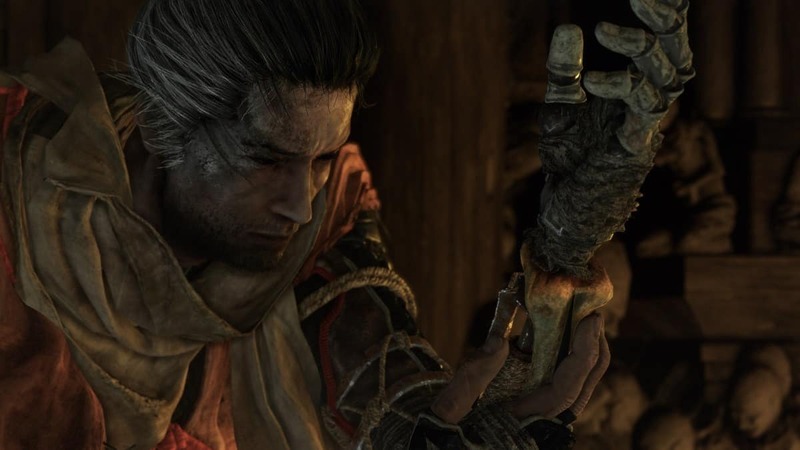 You must use the Bell that you got from the old woman you encountered in Ashina Outskirts between the fights of the Chained Ogre and General Naomori. Use it at the Altar in the Dilapidated Temple where the Sculptor sits. After this, follow the path until you reach the bridge with the two shield-carrying enemies. The area after this is a garden where you will encounter Enshin. Start by focusing your attention on the smaller enemies. Stealth kill the torch enemy nearest the bridge, go ahead and eliminate the archer and the other two melee enemies. Make the boss lose sight of you by running away and backtracking. After which, sneak along the grass on the left and stealth-attack him. This will take away one of his lives. When he attacks, dodge, and try to get behind him to land some hits or alternatively, use the Whirlwind Combat Art. Winning this fight rewards you a Prayer Bead. This boss is located in the Main Hall of the Hirata Estate. Backtrack to the bridge where you faced the two shield enemies, just before the fight with Shinobi Hunter. Jump down into the river and swim upriver until you see a branch on your left that you can grapple on to. Keep following this new path until get to a well that you need to wall jump to reach burning mansions. There you will face Juzou. Before encountering the Drunkard, talk to the Samurai in blue clothing who is standing in the shallow water. He will aid you in this battle by distracting the boss while you take care of the smaller enemies. Eventually, he dies but you can now face the boss one on one. A good way to evade his hits is to lock on and start dodging in his direction until you are behind him. Strike his back and repeat until you win. Winning this fight gets you a Prayer Bead and Unrefined Sake. This enemy is an acquaintance of The Owl and has unfinished business with you. After defeating Juzou, you can enter the Hirata Audience Chamber that he was guarding. There will be an archer there with a floor pad behind him that you can interact with. Follow it downstairs to a big gate that you can unlock with the key you obtained when following the path after the Shinobi Hunter fight. On the path, you will end up meeting a friend in a burning courtyard who gives you the key. The battle begins once you open the gate and pass through. We recommend you equip the Whirlwind Combat Art beforehand for this confrontation. The fight has two phases since after you initially kill her, she will respawn and you will have to defeat her again. Her biggest advantage lies in her huge move set and quick speed so be sure to dodge a lot while observing her attack patterns. Use the Whirlwind attack after dodging to deal damage to her and keep repeating until she dies for the first time. While she is respawning, go back to the place where she first spawned and stand behind her. This allows you to quickly attack her from behind and do some real damage right away. Continue using the same tactics in this second phase of the fight. She has two new attacks now. She can summon illusions to fight for her and can shoot unblockable bright lights towards you that you need to dodge. Be warned that these can kill you if you do not evade them successfully. You can avoid the illusions by running behind pillars while jumping. She summons them again, but you can run away until they disappear. Defeating this boss will grant you the Memory Lady Butterfly Strength Upgrade and Sakura Droplet. You will encounter this boss just after fighting Gyoubu Oniwa inside the Main Castle of the Ashina Outskirts. The flaming bull has a lot of health but luckily, it only has one life and cannot block any of your attacks. Plus, the only attacks it can do to you are with its horns so you will be totally safe if you stand behind it. It has two main movements i.e. running towards you and attacking with his horns quickly while standing still. Dodge forward when it runs towards you to evade the attack. When the bull slides its horns across the ground, watch out! It’s about to do an extremely powerful one-hit kill attack, so always dodge forward when the horn touches the ground to dodge it. The bull will be vulnerable for a second after running so get 1-2 hits in from behind before it turns around. ALWAYS dodge behind it. You can land 2-3 hits while it does its attack motion. It will then turn a bit in your direction so dodge once to get behind its back again and repeat this pattern. Try to get the most damage in while it stands still. When the bull starts running again, keep your focus on dodging and trying to land a hit when the bull turns around. Be careful though, since the running attack can take down half your health. Once the Bull’s health is low enough, just finish it off with the Shuriken from a safe distance. After you have taken out the Blazing Bull, head up the stairs of the Ashina Castle. This boss will be at the top of the stairs with 4 riflemen whom you will have to eliminate first. This boss is exactly the same as General Naomori, but with more health, posture, and damage dealing ability. Once the riflemen are taken care of, make the boss lose sight of you by retreating the way you. Then grapple up to the rooftops to sneak up behind him and do a stealth takedown, eliminating one of his two lives. Simply double-dodge towards him when he attacks you and use a Whirlwind Combat Art until you win. Defeating him awards you a Prayer Bead. To find this boss, take the path to your left after entering Ashina Castle, open a gate, and drop down. You will find the Reservoir Idol with two big hammer guys near it and some stairs leading up to the temple where you first saw the Divine Heir in the Prologue. You will encounter this boss there. This fight plays out differently than the others because this boss’s spear sweeps cannot be dodged. They will hit you regardless of your evasion attempts so the best tactic is to quickly break his guard through a lot of deflection and Mikiri Counters. First, jump left across the trees from the idol and you will land between a rifleman and a drummer who you will have to take out so that he does not alert the camp. Then take the same path from the prologue to climb around the left side of the mountain and through the hole to the temple. If enemies spot you, they will chase you during the battle. After you get to the temple via the cliffside, you perform a sneak attack on the boss and take one of his lives. We would strongly recommend you use the Firecrackers Prosthetic Tool and the Ichimonji: Double combat art. First, do some Mikiri Counters (block and dodge without any direction) when a spear strike with a red sign is about to land. Double jump when the boss uses sweeps and you will do Posture damage. Deflect his other moves while attacking him to prevent his posture from recharging. Start throwing Firecrackers when you get his posture about 30% down. This will stun him and you can use Ichimonji: Double combat art to attack and do massive posture damage. Do this 8 times in a row for an easy win. He will drop a Prayer Bead upon defeat. Jump from the Reservoir Idol to across the two tree branches to the left and you will land in an enemy camp between a rifleman and a drummer. Behind the drummer walk up to the cliff, then look to the right. You will spot a grapple point that will bring you to an area with a friendly samurai standing above a hole. Jump down the hole to get to the boss fight. The best tactic in this fight is to dodge towards the boss as he is about to launch an attack and then use the Whirlwind Combat Art with perfect timing. The perfect timing is exactly when he is about to swing his sword or do another attack so focus on that and he will never be able to touch you. Luckily, he does not have much health so keep repeating this until you win with him dropping a Scrap Magnetite and Prayer Bead. This boss is located in the Upper Tower Ashina Dojo of the Ashina Castle. Head back to the first idol in Ashina Castle then take the path on the right and get on to the roofs. Follow them along until you reach the entrance to the tall tower in the middle of the area. You will encounter some samurais wearing blue robes inside. There are 2-3 of them in a room on the top floor and you can grapple through a hole in the ceiling. From there you can follow the path upstairs to reach the Ashina Dojo at the top of the tower where you will encounter Jinsuke. This boss hits does a lot of damage but at the trade-off of having very poor health and defense. Keep spamming Whirlwind Combat art aggressively as it will damage him, regardless of his blocking. Sometimes, he will still hit you when dodging, in that case, dodge away to heal and repeat. Use Firecrackers to stun him while dodging forward. Keep doing this until he is defeated and he will drop a Prayer Bead. This boss is located in the Upper Tower Ashina Dojo, in Ashina Castle and his fight comes right after you take down Jinsuke Saze. Climb through the window of the room where the last battle happened and go up to the rooftop. This boss fight has two phases and he has two lives. The first phase ends when you take away one of his lives. You should try to deplete his Posture, rather than empty his health. Using the Loaded Axe Prosthetic Tool is great for causing massive Posture damage. Keep the combat close range so that he does not have the opportunity to use his bow or thrust attacks. You can do this by hitting him twice and the blocking/counter his attacks so that his Posture does not recharge. His Posture drains faster when his health is down to 60% so around then you should begin attacking with the Loaded Axe. After taking away both of his lives, he will return with a stronger version of himself and use thunder attacks. Be sure to dodge to the left whenever he jumps in the air and just keep repeating the same strategy as the previous stages until his Posture breaks. Defeating this boss will reward you with Memory: Genchiro Strength Upgrade, Bloodsmoke Ninjutsu. This boss is located in Shugendo, after the second idol in Senpou Temple, Mt. Kongo. One thing to keep in mind during this fight is that this boss does not take health damage so you need to focus all your attacks on his Posture and then throw him off the balcony. Luckily, his Posture does not recharge so that makes things a bit easier. Just dodge or counter his attacks and when he is unable to move in between combos, land some easy hit for a few seconds. Once again, the Loaded Axe works best for Posture damage so hit him with that until his Posture is depleted. Try to make him hit the balcony window during his attacks so that there is an opening for him to fall down. Then grab him and throw him down to defeat him. This battle rewards you with a Prayer Bead, and Breath of Nature: Shadow Skill. To find this boss, go to the Senpou Temple, Temple Grounds Mt. Kongo idol, which is also the third idol in this region. There is a path from there marked by wolves and some monks who throw bombs at you. You will need to grapple up to the temple roof and then jump down to a temple on the right side and then use that temple’s rooftop to access the dark chamber. Eliminate the 3 small enemies sitting on the beams without falling down. If you take them down without alerting the boss, you can then jump on him for a stealth takedown. This takes away one life from the Gentipede. Throughout the fight, focus on depleting the enemy’s Posture by deflecting his attacks, and then fighting using your attacks when it stops for a bit. We recommend that you already have the skills Ascending Carp, Descending Carp, and Flowing Water since they are great for doing Posture damage. If deflecting is proving difficult or if your Posture is draining quicker than anticipated, then you can climb up the beams and then head back down for the attack. This boss fight will reward you with a Prayer Bead, and Yellow Gunpowder Prosthetic Upgrade. This boss fight happens in the Main Hall of the Senpou Temple and is only available after you have defeated Genchiro Ashina in the Ashina Castle. Talk to the Divine Heir in Kuro’s Room at the top of the tower, and find Ishin by following the smoke signals across the tower rooftops. It is only after this that you can interact with the altar near the Main Hall Sculptor’s Idol to take you to the boss fight location. The fight consists of you locating 4 monkeys that you need to defeat in this location. You will find the Invisible Monkey at the very start where you spawned and you can see it trip over some vases on the floor. We recommend you keep swinging until it shows up and then go in for the kill. After that, you will have to take down the Green Monkey who can be found straight across on the other side of the rooftops. Go to the ground level of this building, and then ring the huge bell with the note hanging next to it. You will spot the monkey sitting on the balcony straight ahead of the bell and he can be stunned momentarily by ringing it again. Within this time, you can grapple up and kill him. The third monkey is the Purple Monkey who is hiding in the tower on the top left corner. This monkey will run away when it sees you but you should let him since you need to turn the lights off first. To do that, you need to open the door in the top left tower that will cause the lights to go out. You can then track the monkey through his purple footprints until he goes back to the top left tower. Jump on him from the roof above and do mid-air execution. Lastly, you have to hunt down the Red Monkey. This is the monkey with the drum. Simply chase him to a rooftop, and then crouch to sneak up behind him and perform a stealth execution. The rewards you get after completing this boss fight are Memory: Screen Monkeys, and Puppeteer Ninjutsu. This boss is located at the Gun Fort of the Sunken Valley. Go to the second idol, drop down the cliff by the idol and grapple from the trees as you are falling down. When you spot this boss, you should initially avoid confronting him and go to the Gun Fort idol. Rest at the idol to reset the enemies and then head back to the boss. Riflemen will shoot at you but you can easily evade most shots by jumping. Drop down to the boss and do a stealth takedown from behind to take one of his lives. When he has a red icon popping up, that is when you have to dodge away, as this brings out his grappling attach that is unblockable. If you are hit, just dodge to the left or grapple up to heal. The enemy’s Posture is easy to break when his health is depleted more than 2/3. Then you can easily execute him in one hit. You are rewarded with a Prayer Bead after defeating this enemy. This boss fight also takes place in the Gun Fort, and is to the right of the Gun Fort idol, in the next room. This is also after the area of the Snake Eyes Shirafuji boss fight. Your Posture needs to be high for this fight so be sure to consume an Ungo’s sugar item beforehand. This boss fight plays out similar to the Gentipede Sen’un battle with one exception that you cannot stealth kill him in the beginning, as he can always see you. One of his attacks is a red icon attack that you need to double jump to avoid. Block its chain of attacks while landing in a few hits during the breaks. This boss can be taken down quicker than the previous Gentipede. The boss’s Posture breaks after the second chain so if you have managed to deflect his attacks, you can perform an execution. The reward for defeating this enemy is the Yellow Gunpowder Prosthetic Tool Upgrade, and Prayer Bead. This boss is very smooth, but calculated, and has a hard to predict the pattern. She also has very high health with 3 bars so this fight has three phases that require you to land a Shinobi Finisher at the end of each one. In the first phase, you need to keep deflecting the enemy’s attacks by blocking right before you are about to be hit. Watch out for her lunging attack, as it is unblockable so you will have either jump or dodge to the side. You can also try to overpower this boss by dodging and attacking from behind to break her posture. In the second phase, the Monk covers the bridge in the black fog that she then vanishes into. She will then reappear and attack without warning so be ready to dodge at any second. You can run across the bridge or grapple from tree branches to confuse your opponent until she shows herself. The last phase is similar to the second one but now she will have a few more moves to use against you. Keep the combat close ranged so that he does not have the opportunity to use his bow or thrust attacks. You can do this by hitting him twice and the blocking/counter his attacks so that his Posture does not recharge. Be sure to dodge to the left whenever he jumps in the air and just keep repeating the same strategy as the previous stages until his Posture breaks. Defeating this boss will reward you with Memory: Genichiro Strength Upgrade, Bloodsmoke Ninjutsu. 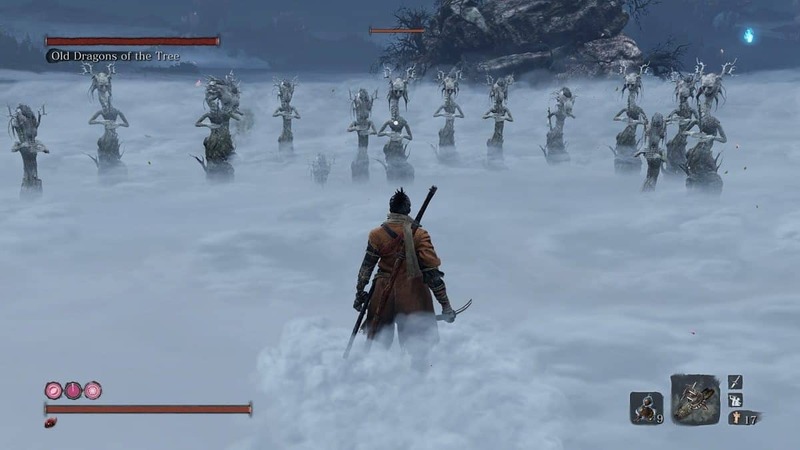 This boss fight occurs in the Ashina Depths region, in the room next to the Ashina Depths idol. The room is a chamber with poison lakes and you get to it by backtracking to the old well where you fought the boss “Lone Shadow Longswordman” in Ashina Reservoir. You should initially ignore the purple boss, as it is one of the headless meant for later. Keep walking until you spot a woman praying at a Cliffside. Jump down the cliff and then grapple up another cliff. Keep following the cliffs until you reach the dark tunnels on the left. The room has shooters everywhere so your first priority is dealing with one of them. Drop down to kill the shooter standing on a platform high up since he has a clear line of fire to where the boss is standing. You can choose to ignore the other, as they will not notice you. Get to the statue near the boss by grappling up the statue on the right and then going through the trees. Sneak down behind him to perform a stealth takedown and take away one of his lives. If you did this right, the enemies will not even detect you. However if they do, the fight gets much harder. After backstabbing the boss, attack him with some combat arts until his health drops below 50%. At this point, his Posture recovers very slowly so just deflect his attacks and do standard sword strikes until his Posture breaks. Then finally execute him to win. Winning this battle rewards you a Prayer Bead. This boss is located in the Ashina Depths – Hidden Forest and you encounter him shortly after the previous boss Snake Eyes Shirahagi. This is actually a part of the main story path so it cannot be missed. Jump across trees from the Hidden Forest idol until you reach a foggy area with ghost enemies. You can grapple up to a tree on the left and there you find Tokujiro being guarded by some small monkeys. First clear out the monkeys and then backtrack until the boss loses sight of you. This fight requires the same tactics as Juzou the Drunkard in Hirata Estate. Return and grapple up the tree branch above the boss. Jump down on him for a stealthy air takedown to take away one of his lives. Then repeat the same tactics you did with Juzou: Evade the boss’s attacks using forward dodge, forward dodge, attack 2 times and repeat. This fight awards you the Unrefined Sake and a Prayer Bead. After battling Tokujuro in the Hidden Forest, grapple on to a tree branch on the side of the mountain to reach a bigger tree, and then head to a temple where someone is playing the flute. To call this one a boss fight would be a bit of an exaggeration. You can drop onto the boss for a stealth takedown through a hole in the temple roof. This enemy is small and has tentacles but poses no real threat since it does not attack or block. Moreover, it dies in a few hits so just finish it off with a few standard sword strikes. After you win, the fog in the area, along with all the ghost enemies will disappear. This fight awards you a Lump of Grave Wax. This boss fight happens in the Ashina Depths, right past the water mill where you will encounter a Lady playing music. She cannot be missed, as she is part of the main story pass so you will have to walk past her to advance, which will lead to her attacking you. O’rin of the Water is an apparition type enemy, so physical attacks are not going to do much in stopping her since she is basically a ghost. You cannot stealth execute this boss so just initiate the fight by attacking her while she is playing the flute. Keep deflecting her attack combos and watch out for her sweep that is marked by a red icon on the screen. You should double jump to deal massive Posture damage to her while landing a few standard sword strikes and keep repeating until her Posture is broken, then execute her. Combat Arts and dodging are slow and will not be affective against her flurry of attacks that track you while you are moving. Deflect until her guard breaks, perform an execution and repeat. If needed, recharge health on other side of the battleground to avoid her close range attacks. This fight will reward you with a Prayer Bead and Breath of Life: Shadow. This fight takes place in the Ashina Depths – Water Mill. This is immediately after our last boss, at the end of the area. This boss is very smooth, but calculated, and has a hard to predict pattern. She also has very high health with 3 bars so this fight has three phases that require you to land a Shinobi Finisher at the end of each one. You can also try to overpower this boss by dodging and attacking from behind to break her Posture. In the second phase, the Monk covers the bridge in black fog that she then vanishes into. She will then reappear and attack without warning so be ready to dodge at any second. Winning the fight will award you a Prayer Bead and Breath of Life: Shadow. When you spot this boss, you should initially avoid confronting him, and go to the Gun Fort idol. Rest at the idol to reset the enemies and then head back to the boss. The enemy’s Posture is easy to break when his health is depleted more than 2/3. Then you can easily execute him in one hit. You are rewarded with a Prayer Bead after defeating this enemy. This boss fight takes place in Bodhisattva Valley, right behind where you fought the Long-arm Gentipede Giraffe boss. There is a big door there that can only be opened with the Gun Fort shrine key that you get from Kuro’s library, in his Room at Ashina Castle. He opens it for you after you talk with him a bunch of times, and then follow the smoke signals across the tower roofs to find Isshin. After its open, follow the path until you reach the idol. This fight has two phases. In the first phase, you fight the Guardian Ape in his normal form. He cannot block your attacks and only has one life. However, his grapple attacks can do massive damage to you so be sure to evade these no matter what. One of them is a sweep attack that can only be dodged by jumping when a red icon flashes on the screen and the other is body slam. He can also fart poison at you or throw poisonous dung, so keep an antidote in your quick items. Be sure to keep your firecrackers equipped so you can stun him, since this will end the fight much quicker. When he is stunned, perform a bunch of standard sword attacks from behind him. Combat arts will be too slow so do not bother with them. After brining his health down to about 75%, he will stagger and you can keep attacking until he retreats. This happens 3 times: at 75% health, 50% health and 25% health. Firecrackers only affect him every 20 seconds so keep blocking his attacks and then use another firecracker to stun him. Blocking his attack chains leaves him open for some quick attacks. The second phase of the fight begins after executing the Ape once. He will now get a huge sword, along with a completely new move set that makes him more dangerous. Being killed will make you repeat phase one so we recommend you really try to get this move set memorized. There are 2 moves that give you an opening. The first is when the ape finishes an attack chain and holds his sword high up in the air he is about to bring it down. Deflect this attack instead of just blocking. It will stagger him and you can get many attacks in under his belly. The other opportunity arrives when he leaps forward and does a single strike that you can simply jump over then land 2-3 sword attacks before blocking again. Another new move he learns is a red terror blast that fills up your terror gauge and then you die instantly. We recommend you run off to avoid this but this status effect can be cured by the Pacifying Agent consumable so keep it in your quick items. After some trial and error, you can win this fight. This fight rewards you with Memory: Guardian Ape and Slender Finger. This boss fight takes place in the Upper Tower of the Ashina Dojo. Once you have taken down the Corrupted Monk and Guardian Ape, backtrack to Ashina Castle through the Abandoned Dungeon. You must reach the tower roofs; on your way there, you encounter Lone Shadow Vilehand in the room where you did the Ashina Elite Jinsuke Saze miniboss fight. Equip your Puppeteer Ninjutsu. Upon entering the Dojo, sneak up behind the non- boss enemy on the left side and backstab him. After this, trigger the Puppeteer skill to make him fight the boss for you. Now you will have some help and the boss’s health will go down quicker. Eventually, your ally will die but by then he will have dealt some real damage to the boss. From there, use the same strategy as for the Lone Shadow Longswordman fight; dodge forward whenever he comes at you with his attack, then do the Whirlwind Slash Combat Art Keep repeating until you win. This fight rewards you a Prayer Bead and Lump of Fat Wax. After that last boss fight, you reach the Endgame. You can find many new mini-bosses spawning in old areas now, or finish the ending first and find them afterward in free roam. You can choose what order or ending you like and if you want, you can create a backup file so that you can try all the different endings. 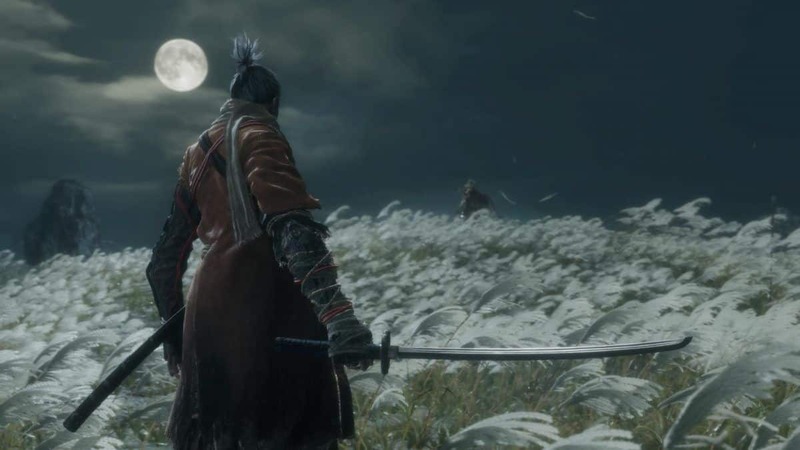 This fight takes place in the Ashina Dojo, located in the Upper Tower of the Ashina castle. You get to choose a game ending upon heading to the tower rooftop. Pick the dialogue option “Obey the Iron Code, Forsake Kuro” to trigger this boss fight and ending. Getting the Shadowrush Combat Art will be very helpful for this fight as it is much overpowered against the last two bosses. The tactic you use in this fight is basic: Spam Shadowrush, jump to evade attacks, Run 10 meters away, repeat. This is particularly effective since Emma and the Isshin Ashina cannot block it. Just keep enough distance so that the attack will connect without being within reach of the enemy’s attacks. Try not to spend too many healing gourd uses on Emma, as you will need them for the next fight. Also, be sure to keep some Pellets equipped for extra healing and Ako’s Sugar to boost your attack. Finishing this battle triggers the Isshin Ashina boss fight. You can win this fight by using the exact same strategy as the last one. Spam Shadowrush, jump, run 10 meters away, repeat. This fight has two phases. In the second phase, Isshin start shooting fire at you. When he shoots it in a straight line, evade it by running to the side. Avoid his wider blasts by staying in front of him, all the while you should be charging up your Shadowrush to use on him once. His biggest gun is an attack that sets the majority of the area ablaze. For this, simply find and stand in a spot that is not engulfed in flames, then immediately jump in his direction. This is because he will charge at you with an attack chain that would one-hit kill you. Once you jump above him, attack him a few times from behind with standard strikes. If you kept some Ako’s Sugar, you will do more damage and thus, the fight will end sooner. 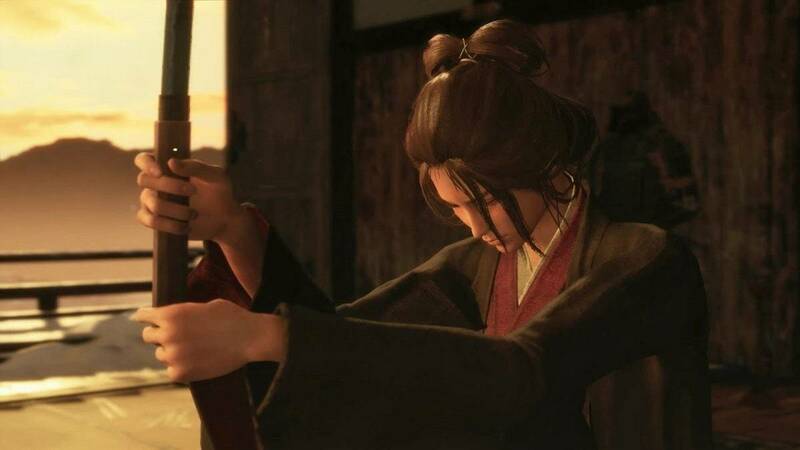 This fight will reward you with Memory: Isshin Ashina and One Mind Skill (Combat Art). This will give you the Shura Ending of the game. When selecting an ending on the rooftop, pick the dialogue option “Break the iron code, stay loyal to Kuro” to trigger this boss fight. This will initiate the “full ending”. Great Shinobi Owl does some heavy attacks that can do massive damage but if you dodge them correctly, they leave him vulnerable for a few seconds so you can land some hits in. When he attacks from the left, you dodge forward left. When he attacks from the right, dodge forward right. Dodge under his sword to get behind him, and then do a Whirlwind Slash Combat Art. Keep the fight close range and whenever he launches an attack, you dodge under it, do Whirlwind slash, repeat. In the second phase of the fight, he will throw poison and smoke at you. He is vulnerable while he readies himself to throw smoke so use this to land some hits. Stay away from poisoned areas and hold block to avoid damage until it dissipates. This fight rewards you the Memory: Great Shinobi and Aromatic Branch. After having chosen to stay loyal to Kuro in the end and having won the Great Shinobi Owl boss fight, go talk with Kuro in his room until all dialogues are exhausted. Backtrack to the Wedding Cave Door idol in the Ashina Depths. In the cave where you picked up a story item, enter a tent to be transported to the Fountainhead Palace. You will encounter the True Corrupted Monk here. This boss has 3 lives, of which two can be taken quickly with stealth kills from the trees above. Just grapple up to a tree branch and stealthily drop down on him for a stealth kill. Retreat and the repeat this in the second phase. During his last life, throw firecrackers to stun him, attack with standard sword strikes from behind and repeat. Consuming an Ako’s Sugar will increase attack and speed up the process. This fight awards you the Memory: True Monk, Dragon’s Tally Board (this unlocks New Items in Merchant Shops) and the Corrupted Monk achievement. This fight is only possible after having unlocked the “Puppeteer” Ninjutsu by defeating the Folding Screen Monkeys boss at the end of Senpou Temple Mt. Kongo region. The Great Serpent is only available to kill once you have advanced through the Sunken Valley region. The fight itself is not really much of a battle but finding the beast is a tricky task. Head to the Senpou Mt. Kongo idol and drop down the cliff from there. You will spot a single enemy standing by a lever with a kite attached. Backstab this enemy and use the Puppeteer skill to make him use the lever to move the kite and hold it in place. Proceed through the monk forest; head to the prayer room, and to the next area where a large tree is on the right side. From that tree, you can grapple the kite and use it to fly to the other area. Then drop down the platforms and grapple tree branches to break your fall until you arrive at the Sunken Valley Cavern idol. There will be a wooden beam that you can balance yourself on and the snake will be directly below you. From there, just drop down on the Great Serpent’s head to execute it. It is an instant kill and this fight rewards you a Fresh Serpent Viscera along with the Great Serpent trophy. This fight takes place in the Poison Pool after defeating the Corrupted Monk in Ashina Depths and the Guardian Ape in Sunken Valley. This version of the Guardian Ape is in the arena between the Poison Pool idol and the Hidden Forest idol. This fight plays out a lot like the second phase of the original Guardian Ape fight except now he is slower and his two health bars deplete much quicker because your attack power is greater after the other fights. Just block his attack chain, and then attack with standard sword slashes while he slowly gets ready for another. Once you take down his first health bar, he will retreat to the side to call another ape to his aid. You can land some hits while he is doing this and kill the other ape very easily. Break its Posture quickly with firecrackers and go for an instant execution. Then go back the same tactic as before for the headless ape. When you see its red mist, run away from it. After he is defeated, rip out his spine with execution to get the final Ninjutsu. This fight awards you two Prayer Beads, the Bestowal Ninjutsu, and the Guardian Ape Immortality Severed trophy. This boss fight happens at the Fountainhead Palace. Found at the Feeding Grounds idol. See the steps detailed below. This is a secret boss and defeating it involves more than just fighting. You have to poison it with some trickery to kill it. First, you should activate the Feeding Grounds idol. You can reach the Feeding Grounds through the Palace Grounds idol that you pass by on the normal story path. Just play through the region until you reach the Palace Grounds. Take a right turn from there in the building that has tentacle enemies inside. You can grapple to the roof from behind the building, and from there to a tree branch, a temple roof, and ultimately the Feeding Grounds. Talk to the blue fish-like NPC and ring the bell to call forward the Great Colored Carp. Teleport from the idol to Hirata Estate and talk to the Scale Merchant there. Purchase enough items so that it amounts to a total of 7 Treasure Carp Scales. This gives you the option to talk with him so do that until he gives you the Truly Precious Bait. You can use this to poison the Carp once you head back to the Feeding Ground. After this, head to the Guardian Ape’s Watering Hole in Sunken Valley. You will find the carp has deceased body with a glowing item pickup before its mouth. Pick this up to unlock the Great Colored Carp trophy. Bring the item you found back to the scale merchant to end this boss fight. 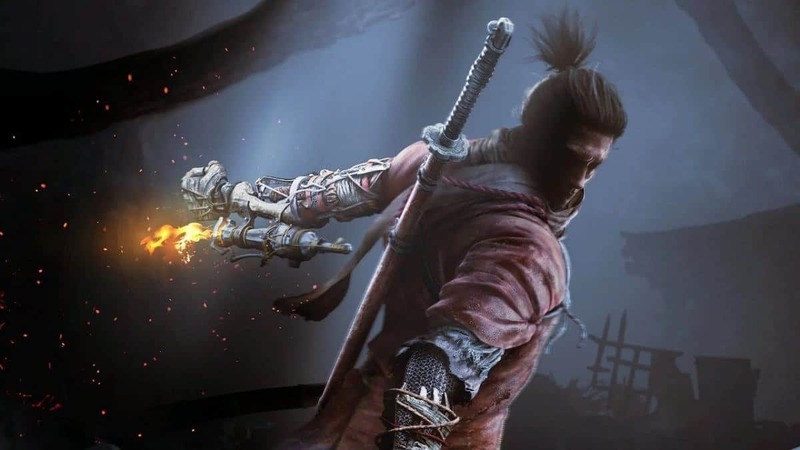 Our Sekiro Bosses Guide is currently a work-in-progress. We will continue to add more bosses in the days to come. Stay-tuned!